I have multiple installations of MCEBuddy, and would like to monitor multiple stutus panels on a system… Since you have removed the multiple instance capability, could you please implement a multiple install window, so that one machine’s MCEBuddy would be on one section, and another on another section (allowing more than two would be a fair idea), this could be in a single MCEBuddy Status. This should be easy, start the MCEBuddy Status application more than once, it will more a new status window for each time you start it. Click on the Connection button at the bottom left of the screen. Enter your mcebuddy engine machine name or ip address (assuming you haven’t changed the port). 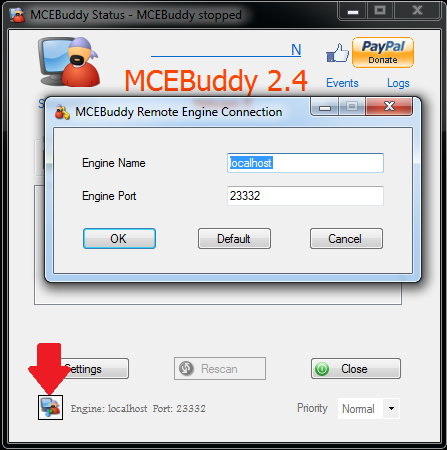 The right way to connect to multiple engines would be to use the MCEBuddy Remote Client (since typically you’ll have only one engine per machine, each remote client can connect to a single engine). This is a zip file, extract the files into a directory and click on the file MCEBuddy.GUI.exe to start the remote client. The reason it’s a zip file is that windows only allows each setup to be installed once, hence you can’t install MCEBuddy more than once on a single machine. However using a zip file you can extract the files into multiple directories and start each one separately. Remember you can start each directory install only once, so if you want say 3 dashboards, extract the zip file into 3 separate directories. Start each one separately. The added advantage is that the settings are stored in each directory’s config folder, so each remote client will remember which engine they were connected. Now you can start multiple remote clients from your startup script to create a dashboard. So the purpose of running remote client on computer 1 is simply to keep your eye on another machine, computer 2? Specifically, you have to set up Computer 2 to convert its own files, but the remote client allows you to monitor progress from computer 1? Yes, that’s the idea of remote clients. However, some of us maintain a full install on computer 1 for other purposes, including offloading some of the workload. In that case, you could have Computer 1 working on files from a watched folder shared by Computer 2, but you would not want to have Computer 1 working on the same watched folder as Computer 2’s watched folder, i.e. you do not want Computer 1 and Computer 2 working on the same watched folder. Correct? I have a dvr server, I also have it installed on my main pc. I have the dvr server running all the time, recording and transcoding, but it’s headless (no monitor), and in a rack. I have my main pc, that I occasionally try to offload the workload onto, to help get through the backlog, or, want to convert other media (still digitizing my physical collection), so it occasionally has things to do on it’s own. I want to monitor both computer’s mcebuddy’s, and even though I put the remote monitor, and the full version in different folders, it still gives me the only one instance error. I would like to see a “tile” option, in the monitor window, so that multiple computers can be monitored in one window. What build version are you using? It’s working fine here. See my post above, we fixed it in 2.4.9 so download the latest BETA and then try it. Have you checked out the posts on shared queues, distributed encoding and load balancing? Only my dvr server runs 24/7, the main pc, just turns on when I want to use it, but, most of the time, I’m just doing youtube/twitch/other media, but, I do do some gaming and other activities that require the cpu. It took me weeks, to figure out how to write a script to simply move completed recordings off the dvr, onto the nas automatically in batches (to save hdd wear). It seems, that if something could be integrated into mcebuddy to do que sharing (with file copying and file transfer of completed, it would go a long way. I don’t know if I am just asking too much, or not. I wrote a batch script that MCEBuddy runs when it starts processing each file. If the main computer is above the threshold you set, it starts looking for other instances of MCEbuddy you’ve entered as back-ups. If it finds one idle, it moves the file to where the back-up computer can find it and process it. If it doesn’t find a back-up computer, it keeps plugging away like usual. You have to set up each instance of mcebuddy to access and monitor the right locations, and process the files the way you want. That part isn’t automated, but once you input that information for each computer, it should just run. Here’s where I posted the script and more info about it. Let me know if you have any questions.